This article published on International Women's Day 2017, shines a light on the issue of forced labour, as 55% of people who are estimated to be in forced labour are women and girls. It also discusses modern slavery legislation changes and discussions in France and Australia. This legislation could contribute to the goal of SDG target 8.7 which is to take immediate and effective measures to eradicate forced labour, end modern slavery and human trafficking and secure the prohibition and elimination of the worst forms of child labour, including recruitment and use of child soldiers, and by 2025 end child labour in all its forms. 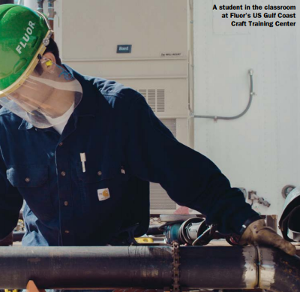 The rush to build large-scale petrochemical complexes in the US Gulf Coast area has encouraged companies to take a collaborative approach to finding and encouraging talented and skilled workers. The drive for growth cannot be achieved without creating decent work for all which advances SDG 8 Decent work and economic growth. Shakespeare’s allegory can be employed to articulate sustainable strategies in many of the SDG themes. For example, SDG 3 (Good health and well-being); SDG 7 (Affordable and clean energy); SDG 8 (Decent Work and economic growth); SDG 13 (Climate Action) and SDG 16 (Peace, Justice and Strong Institutions). This article examines how Shakespeare's works anticipate sustainability narratives for society at large and its individual actors. This article provides insight into an international company that is dealing with human rights issues in its supply chain from the past, in particular modern slavery, but which in recent years has been one of the early adopters of ongoing human rights due diligence. This is in line with the goal of SDG target 8.7 which is to take immediate and effective measures to eradicate forced labour, end modern slavery and human trafficking and secure the prohibition and elimination of the worst forms of child labour, including recruitment and use of child soldiers, and by 2025 end child labour in all its forms. LexisNexis Australia has created a free legal resource to assist those working on pro bono cases and social justice issues. It provides practical information on charities, federal discrimination law matters, human trafficking cases and applying for humanitarian immigration into Australia for victims of human trafficking. This free guidance supports target 8.7 and the eradication of forced labour, modern slavery and human trafficking, as well as SDG 16.3 and access to justice. This paper argues that product stewardship strategies that integrate environmental information along the value chain help enable the transition to a more circular economy. Examples from automotive, ship and aircraft industries are presented, analyzed and discussed. This article explores how the development of a more circular economy supports several of the SDGs, including SDGs 8, 9 and 12 by examining the opportunities sustainable manufacturing offer. Are our 3 favourite Christmas gifts tainted by modern slavery? Consumers' purchasing behaviour is increasingly influenced by businesses' ethical behaviour. As Christmas is a time of celebration and this goes hand in hand with consumption, this article explored some of the products that are at risk of being produced by people in modern slavery. The transition from the Millennium Development Goals (MDGs) to Sustainable Development Goals (SDGs) has shifted the policy debate from growth to ‘quality of growth’ (QG). We explore a new dataset on QG by the IMF and classify 93 developing countries for the period 1990–2011 in terms of Hopefuls, Contenders and Best Performers. The aims are as follows: (i) to depict the contradiction between high-growth and poor social welfare and (ii) to assess the influence of education and health spending on the QG. The findings have implications on education and health policy, and support SDGs 3 and 4. This feature length article highlights findings from three new reports, showing the progress by companies complying with the UK Modern Slavery Act. With almost half of FTSE companies currently not complying, and 77% of companies that participated in a recent research study agreeing there is a likelihood of modern slavery occurring in their supply chains - there is still much to do. The goal of SDG target 8.7 is to take immediate and effective measures to eradicate forced labour, end modern slavery and human trafficking and secure the prohibition and elimination of the worst forms of child labour, including recruitment and use of child soldiers, and by 2025 end child labour in all its forms. 18th October 2016 was the 10th EU Anti-Trafficking Day, coinciding with the UK's Anti-Slavery Day. This article published on this day of awareness reflected on the considerations and opportunities for businesses regarding modern slavery, including the establishment of Alliance 8.7, focused on accelerating the work on SDG 8.7, which is to take immediate and effective measures to eradicate forced labour, end modern slavery and human trafficking and secure the prohibition and elimination of the worst forms of child labour, including recruitment and use of child soldiers, and by 2025 end child labour in all its forms.